We’d love your help. Let us know what’s wrong with this preview of Lawfully Yours by Stacy Hoff. The prestigious Connecticut law firm of Grovas & Cleval has always been rife with office drama and crazy clients. But an office affair between a young associate and a powerful partner—her boss—might be the biggest scandal of all. Quirky, quiet Sue Linkovitch is Jordan Grant’s newest hire. Barely out of law school and hired on a fluke, she has no idea what she’s gotten The prestigious Connecticut law firm of Grovas & Cleval has always been rife with office drama and crazy clients. But an office affair between a young associate and a powerful partner—her boss—might be the biggest scandal of all. Quirky, quiet Sue Linkovitch is Jordan Grant’s newest hire. Barely out of law school and hired on a fluke, she has no idea what she’s gotten herself into. Unfortunately, Jordan isn’t sympathetic to her professional “growing pains.” In fact, he’s downright frosty. The only time he thaws is when he’s around his five-year-old daughter. So why is she so attracted to him? Published March 11th 2015 by Soul Mate Publishing, Inc.
To ask other readers questions about Lawfully Yours, please sign up. Welcome to another Off Theme, Off Schedule Review, my lovelies! This week’s found me traipsing into the Land of the Law and, whew, what a ride it was! Lawfully Yours by Stacy Hoff—and released by Soul Mate Publishing—was a delightful and humorous contemporary workplace romance. It heralded a quirky and hilarious leading lady, and a dashing and brilliant hero. And to say it’s obvious Ms. Hoff has some serious insider knowledge on the law would be an understatement. The world she weaves is one cho Welcome to another Off Theme, Off Schedule Review, my lovelies! This week’s found me traipsing into the Land of the Law and, whew, what a ride it was! 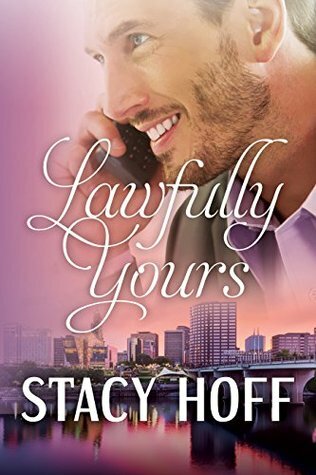 Lawfully Yours by Stacy Hoff—and released by Soul Mate Publishing—was a delightful and humorous contemporary workplace romance. It heralded a quirky and hilarious leading lady, and a dashing and brilliant hero. And to say it’s obvious Ms. Hoff has some serious insider knowledge on the law would be an understatement. The world she weaves is one chocked full of tidbits and details that make it positively come alive. This is the second book I’ve read and reviewed for this author, and just like her New Adult Contemporary Romance Mad for You in Madrid, the story grabbed my attention from page one and kept me entranced and grinning all the way to the end. I’ve said it before and I’ll say it again, Ms. Hoff is a master of the tropes. Her plot lines and characters stay tried and true to expectations, yet veer just enough off course to leave you wondering what’ll happen next. It’s the perfect combination of comfortable and daring. This book was fun to read as it was a good, clean love story.It was well written and the storyline was great. It kept my interest & pointed out how hard it is to carry out an office romance. What a fun read! I enjoyed the sarcastic humor. The heroine was a classic introvert, and being familiar with the traits, I could appreciate all the ups and downs she goes through. I liked how the heroine evolved from second-guessing herself and her relationship with others, to realizing not everything is as bad as she thinks, to coming out on top and being confident in herself and her work. Stacy Hoff is an author to keep an eye on. She has a unique imagination and keeps coming up with fun scena What a fun read! I enjoyed the sarcastic humor. The heroine was a classic introvert, and being familiar with the traits, I could appreciate all the ups and downs she goes through. I liked how the heroine evolved from second-guessing herself and her relationship with others, to realizing not everything is as bad as she thinks, to coming out on top and being confident in herself and her work. This book was ok. It was boring at times. But, I just didn't get into it that much. Still, going to try her others books. Very funny and dramatic. Stacy Hoff portrayal of law firms is spot on. Oh how the politics play into it. This was a fast, excellent read.